This blog is, in general, monomaniacal regarding its subject — The Durham Bulls Baseball Club. However, on occasion there are matters of such deep and abiding concern that they cannot be ignored. This morning’s News & Observer gave us one such instance. It would seem that the good people with PETA have taken umbrage at the annual Clay’s Corner New Year’s Eve Opossum Drop. Well, just next door to Clay’s Corner out there in Brasstown, NC (just east of Murphy) is my favorite place in all of North Carolina, the John C. Campbell Folk School. Brasstown itself is a community of something like 200 souls and Clay’s Corner is just about the only business left. I like visiting Clay’s Corner and Brasstown whenever I’m at the Folk School. As noted in the story, on New Year’s Eve an opossum is placed in a plexiglass box and hauled up into the air. At the stroke of midnight the 'possum is lowered to the ground and released. Opossums of my acquaintance would consider it an honor to participate. 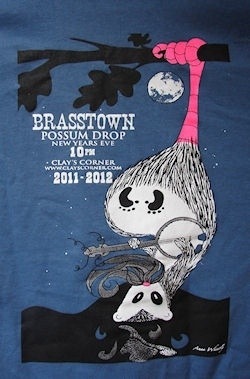 Probably a good idea if them fellers up there in Washington, DC just leave the good folk (and 'possums) of Brasstown alone. 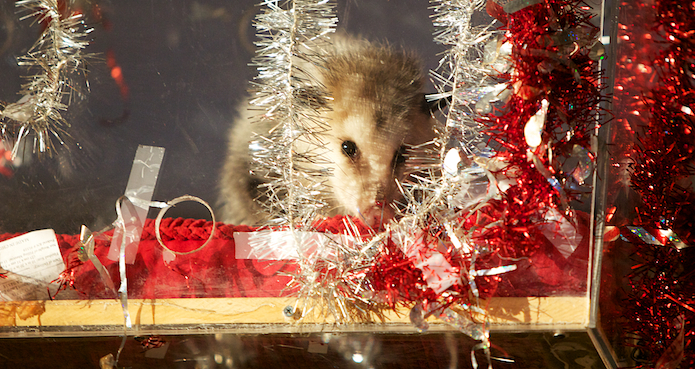 Complaining about an opossum drop is sillier than the 'possum drop itself.